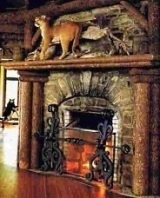 The pictures of rock fireplaces depicted in the web pages outlined below expand upon the listing of casual and rustic stone or rock fireplaces displayed on our Standout Rustic Rock Fireplaces web page. In keeping with the wide range of exciting looks featured on that page, the listings that follow include a vast and varied array of unique designs made from a variety of stone types, sizes, colors, textures and finishes. From a cozy fieldstone fireplace to a soaring multi-story extravaganza, you are sure to find inspiration for that special place in your home or cabin. And once again, we invite you to kick back and enjoy! The Old West Lives On! A Roundup of Exceptional Designs! Relax in a Rustic Setting! A River Stone Fireplace Rocks!